The currency rate on the foreign exchange was changed in 1971, from a fixed to floating, which caused a new market to appear. Thanks to this, the exchange rates of the currencies of two countries could be traded for one another, at a rate which would vary. Because of this reason, the amount of currency which is traded increased a lot, reaching $3.2 trillion USD in 2007, which was 71% more than what it was traded in 2004. As you can see, Forex trading can be a very profitable way of making money and the market is huge. The fact that exchange rates are volatile can be used by traders to make a very nice profit, as long as they know what they’re doing and they did the proper research. In the long run it pays to be a hard worker, since this isn’t a way to make money without investing some time as well. The Forex market is the bigged trade market in the world and it’s also the one that runs for the most amount of time, since it runs 24h per day, during the work week, with a pause during the weekend. The international events tend to influence this market much more, since it’s open all the time. Understanding Forex trading means that you should learn how the currency is exchanged for one another and you should also try to understand how the International markets work and how economy develops. It’s not that hard to understand how the fundamentals work, but being truly good at trading Forex takes years of practice and gathering experience. Doing Forex trading these days is done either by phone or with the help of the Internet, which is much more common these days. You can be in any country in the world and you will still be able to trade, as long as you have access to the Internet. Forex trading online is done with the help of a decent Internet connection, the time and will to learn how it’s done and the money which you need to invest. It’s much cheaper to operate by using the Internet than it was in the past, when this option was not available. If you look at the basics, trading is all about buying or selling something. When you trade, you buy as cheap as possible and you sell at the biggest price possible. Trading Forex is a bit like that, except there are no goods to be sold or bought. The currency itself is the thing which is traded and the system is more of a barter, one currency for another. Just how much foreign currency you can get in return for your own currency is decided by the exchange rate, which is volatile, so it changes constantly. Making money with Forex means that you buy a currency when it’s weak and you sell it when it’s strong. 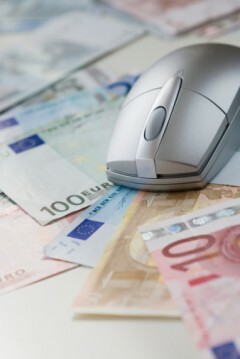 There are a number of companies which deal with online brokerage, using the Internet to trade currency. To get started with Forex trading online, you should first know the jargon which is used. After that, learn how the prices form and what influences the exchange rates. From the markets to international trade and central banks, there are many factors which can influence the exchange rates. Whatever choice you make when you trade online, it should be done based on information you have, obtained from research and experience. It shouldn’t be a transaction based on instinct alone, since it can’t help you when you don’t have crucial information to base it on. Doing a lot of hard work and proper research is always necessary, though these days it’s much easier, since you have the entire Internet and a network of financial sites which give you information. All you have to do is monitor the financial news and carefully analyze the data, in order to be able to make an informed decision. As a beginner, you should get a practice account and start trading with a small amount of money. Find charts, look at past data, at exports and imports between the countries which issue the currencies you want to trade, look at what the experts recommend and start trading and learning as you go. Remember though, don’t spend a lot of money, just work with small amounts until you learn how it’s done.